As part of our 2016/17 salary survey, Be-IT has once again commissioned a really interesting piece of research into candidates’ job hunting intentions and also the channels they use to find new jobs. The research was carried out by an independent third party*, using Be-IT’s extensive candidate database, our consultants’ substantial number of Linkedin contacts, a SurveyMonkey and a complementary social media campaign. We’ll publish the results of this in three blog articles over the next few days, starting today with our analysis of job movement intentions. 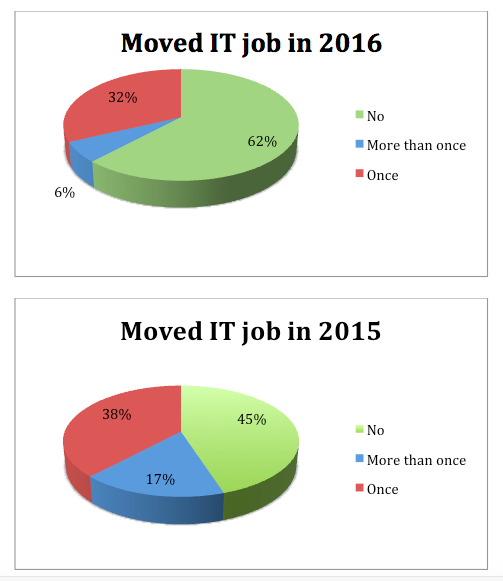 The first question asked respondents if they had moved jobs in 2016, which we then compared to the results from last year’s survey. In 2016, some 32% said they had moved only once, but a surprisingly high number (62%) said had not moved at all. Only 6% had moved more than once. Compared to 2015, the percentage who had moved only once is not too dissimilar, but the number who have not moved is considerably down (62% in 2016 compared to 45% in 2015) and this seems to be related to the fall in the number who have moved more than once, which fell from 17% of our sample in 2015 to the aforementioned 6% in 2016. This reflects the tightening of the job market which all recruiters – and the Markit and APSCO (see below) surveys – found in the latter part of last year. In my opinion, the reasons for this are not too hard to identify. The first half of 2016 was generally good for recruiters, with most businesses being in a positive frame of mind and recruiting healthily. Then, at the end of June, there was the Brexit vote and many firms, both large and small, reacted to the immediate shock of the result by tightening the purse-strings, cutting back on hiring and taking stock while they waited to see how the economy would respond. At Be-IT, our clients’ uncertainty manifested itself in a 40% reduction in vacancies in Q3 compared to Q2 of the calendar year. 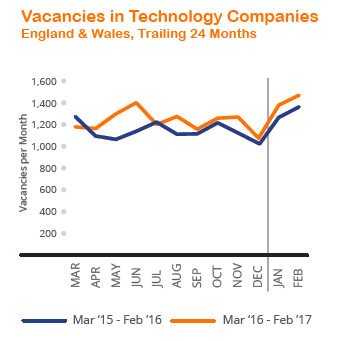 We know we were not alone in this, because the APSCo review of the IT sector in England and Wales showed clearly (see the orange line on the graph) that IT vacancies slumped after the Brexit vote and then, after a slight revival, fell away again at the end of 2016. This very much mirrors our own experience at Be-IT, although as you can also see, things have very much picked up since then (again, mirroring our experience). Now although there is always a seasonal drop in July and August, the fall in 2016 was far harder than would normally have been expected at this time and it was clear from conversations with clients and candidates alike that businesses – and especially the multi-nationals - were not rushing to hire until they saw which way things were going. From the candidate side, most people, seeing the lie of the land, adopted the two cautionary principles usually relied upon in such circumstances – ‘better the devil you know’ and ‘let’s not move just now because it’s always last in, first out if things get any worse’. With less motivation to move, fewer jobs and an underlying degree of uncertainty, it is unsurprising that we have seen this stasis in the recruitment market in the second part of 2016. The number moving more than once is also interesting for another reason. Last year, we were approached by Scottish Enterprise, who were keen to find out if the turnover rate for IT staff in Scotland was lower than in the USA, where it is high, with many people moving jobs more than once a year. The fact that it is low here obviously makes Scotland a more attractive place for American firms to set up a new venture. This year’s survey reinforces that message. We’re all for that, especially if they need new staff! When we then considered the number who said they would be looking for a job in the first six months of 2017, the results were broadly similar to the previous year, but with interesting changes in the key metrics. The percentage of those who emphatically do not want to move has increased between 2015 and 2016. This follows on from the analysis above, where we saw many candidates taking a ‘wait and see/better the devil you know’ approach. This is also supported by the finding that the percentage saying they would move in the new year declined slightly from 53% in 2015 to 47% in 2106. More candidates staying put, fewer wanting to move at all, a slight decline in the numbers saying they would move in 2017 - it’s not surprising that recruiters have seen the market for candidates became even more sticky since the latter part of 2016. Clearly, respondents to our survey reflect the overall picture in the ‘IT economy’ at large, and this is also borne out by the difficulties some clients have in recruiting in 2017 thus far. With Article 50 now signed and the Brexit negotiations about to begin, we’re embarking on a roller-coaster journey that will have numerous ups and downs and twists and turns before it reaches its conclusion. It’s at times like these that good recruitment practices, and experienced recruiters, really come to the fore.